crucial role in the spread of the new faith in Tibet. More than hundred years later, King Trisong Detsen invited Shantarakshita, the Abbot of Nalanda to teach the Buddha Dharma and ordain the first monks. Shantarakshita immediately faced serious difficulties due to the strong opposition from the indigenous Bon. He convinced the king that only way out was to invite the Tantric Master, Guru Padmasambhava; he alone could subdue the forces adverse to Buddhism. Shantarakshita also predicted that a dispute would arise between the two schools of Buddhism, the Indian and the Chinese. The issue was sorted out through the famous Samye Debate. After 2 years of intense discussion, the Indian path prevailed and a proclamation was issued stating that the Indian path was thereafter the orthodox faith. 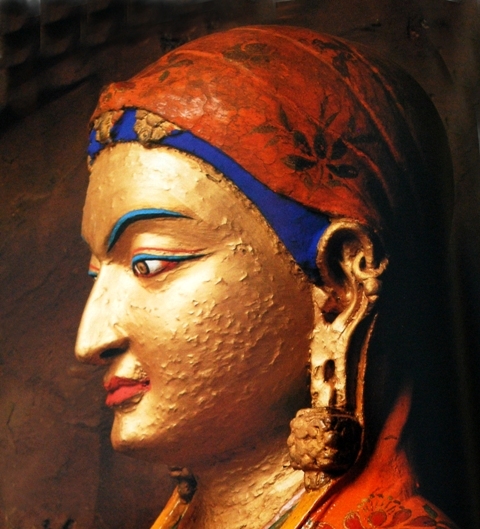 Chinese historians have a tendency to forget that Bhrikuti, the Nepalese princess ever existed. For example in the White Paper on Tibet's Ownership published by the State Council in 1992 there is no trace of Bhikuti. The White Paper says "Tibet is located in southwest China. The ancestors of the Tibetan race who lived there struck up links with the Han in the Central Plains long before the Christian era. Later, over a long period of years, the numerous tribes scattered on the Tibet Plateau became unified to form the present Tibetan race. By the Tang Dynasty (618-907), the Tibetans and Hans had, through marriage between royal families and meetings leading to alliances, cemented political and kinship ties of unity and political friendship and formed close economic and cultural relations, laying a solid foundation for the ultimate founding of a unified nation. In Lhasa, the capital of the Tibet Autonomous Region, the statue of the Tang Princess Wen Cheng, who married the Tubo tsampo [Songtsen Gampo], king of Tibet, in 641, is still enshrined and worshiped in the Potala Palace." Now Bikruti has reappeared, just because Nepal is needed by Beijing to extend its influence over the Himalayan region. Nepal has fast becoming China's ally against India. Read the report of the Nepali President's visit to Lhasa. LHASA: President Dr Ram Baran Yadav visited the Potala Palace, a place of historic, archaeological and religious importance, here this morning. The Potala Durbar was listed in the list of Word Heritage Sites in 1994 by the UNESCO. President Dr Yadav was welcomed by the deputy chief of people’s government of Tibet Autonomous Region (TAR). The Potala Durbar was built by Songtsen Gampo some 1,300 years ago. Songtsen Gampo had married to Nepali princess, Bhrikuti, who is also the national luminary of Nepal. The 12-storied palace built into a stone like structure has 1,000 rooms. The rooms are well decorated with the artistic idols of the Dalai Lamas, religious gurus, Songtsen Gampo, his wife Bhrikuti and another queen Wencheng. The room having the idol of Bhrikuti was opened today. Similarly, there is a large idol of the Dalai Lama Zamling Gyanchi weighing 721 kgs. It had taken some 40 years to construct the palace where the tourists are allowed to visit in limited numbers based on the weight bearing capacity of the structure. The palace has also relics inscribed in Nepali language depicting the art and culture of Nepal. President Dr Yadav also visited Chokhang temple here and acquired various information about it. The temple built circa 850 AD was named after Songtsen Gampo’s queens Wen Cheng and Bhrikuti. Famous pilgrimage site for the Buddhists, the temple has the main gate facing Nepal, the birthplace of Bhrikuti. One can see the letters carved in Nepali language in various places of the temple where the idols of Lord Buddha have been installed. On the occasion, President Dr Yadav also visited the Nepali market on foot at local Bharbor for some twenty minutes and acquired information about it. Full of hustle and bustle as in Asan and Indra Chowk of Kathmandu, the bazaar is dwelt by the local Nepali community which is involved in trade. Present on the occasion were the members of the visiting team and Consular General Ngaindra Prasad Upadhyay and other employees. Moreover, President Dr Yadav inspected a new University in Tibet today. The largest and well facilitated university of TAR has 1,070 people including the lecturers and employees. The University Chief, Professors and the officials had welcomed President Yadav and briefed him about the university. The President's entourage comprises the President’s daughter Anita, Minister for Tourism and Civil Aviation Sharat Singh Bhandari, President’s advisor duo Dr Surya Prasad Dhungel and Hari Sharma, Nepali Ambassador to China Tanka Prasad Karki, Secretary at the President’s Office Baman Prasad Neupane, Foreign Secretary Dr Madan Kumar Bhattarai, Protocol Officer Muktinath Bhatta, Consular General at Lhasa Ngaindra Prasad Upadhyay, Chinese Ambassador to Nepal Qiu Gouhong, high level officials and journalists. President Dr Yadav will leave for Sian today on completion of his two-day visit to Tibet. 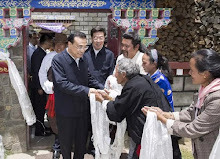 The President had arrived here on Tuesday on a weeklong goodwill visit in connection with his participation in the concluding ceremony of the Shanghai Expo-2010. Meanwhile, chief of the People's Government of Tibet Autonomous Region (TAR) of China, Padma Choling paid a courtesy call on President Dr Ram Baran Yadav here today. On the occasion, President Dr Yadav reiterated Nepal's commitment to one-China policy and expressed the determination to not allow Nepali territory to be used against China. During the meeting, Dr Yadav also urged to speed up the campaign to extend road network up to the border transit points. Noting that constitution writing and peace process is underway in Nepal, President Dr Yadav said, "Nepal expects support from China and Tibet in this regard." The President also stressed on the need for a common concern and interest in improving the living standard of the people of the two countries through collaboration in the industry and trade sector. On the occasion, Chief of the People's Government of Tibet, Padma expressed the confidence that activities against Tibet and China would not take place in Nepal, as Nepal has been giving high priority to one-China policy. Referring to the cooperation of the Central Government to Nepal in expansion of road network, hydropower, infrastructure development, education and health among others, Padma said Tibet is also ready to provide cooperation as much as possible in the economic and commerce sector along with building the road network. 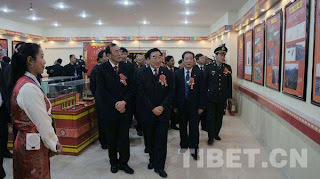 President Dr Yadav also attended a reception organized in his honour by the Chief of the People's Government of Tibet. Also present on the occasion were Dr Yadav's daughter Anita, Minister for Tourism and Civil Aviation, Sharat Singh Bhandari and other members of the entourage. China is practicing hard in case of an eventual conflict. General VK Singh was right to speak of 'irritants'. These exercises in Tibet can only be directed at India and this, when the Indian Prime Minister is soon to meet his Chinese counterpart. 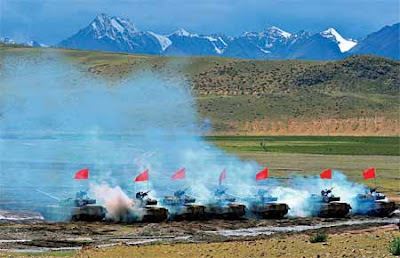 Near the foot of the snowcapped mountains on the Tibetan Plateau at an altitude of over 4,700 meters, the Tibet Military Command of the Chinese People's Liberation Army (PLA) conducted its first air-ground live ammunition drill recently, according to PLA Daily.Troops of air force, armor, artillery and electronic warfare divisions participated in the exercise. They overcame the effects on their physical and mental health caused by coldness and oxygen deficits and finished the first joint training and exercise. It will have a very significant role in exploring training patterns in mountainous and cold areas as well as improving combat capabilities. 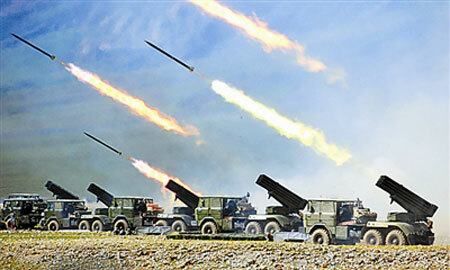 China is celebrating with fanfare the 60th anniversary of 'Liberation' of Chamdo. It is not clear why Chamdo (and the Tibetans) needed to be liberated. Sixty years later, nobody can answer this question. 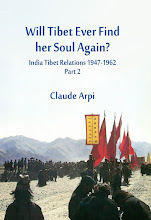 I am posting an extract of my book "The Fate of Tibet" about the so-called liberation. In fact it was purely a military operation. Hundreds of Tibetans were killed. Nobody was liberated. It is unfortunate that the Chinese government which pretends to a superpower status continues to propagate this lie. The rumours of an impeding attack had started trickling in from August. 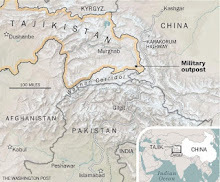 Pannikar [the Indian Ambassador to China] knew it, he knew that the Chinese had already entered in the Chinese-controlled areas of Kham (Sikang). In a communication to the Chinese Foreign Office on 2 October he informed the Chinese that the Tibetan Delegation would be leaving India shortly to Peking and had expressed the hope that further military action would, therefore, not be necessary. "It will help the peaceful settlement of the Tibetan question if the Chinese troops which might have entered territory under the jurisdiction of the Lhasa authorities could restrict themselves to western Sikang." In Chamdo, Robert Ford, the British radio operator employed by Lhasa had arrived in December 1949. He had already spent some months in Lhasa with another Englishman, Reginald Fox, who operated a radio set for the Tibetan Government. Ford, ‘Phodo Kusho’ as the Tibetans called him, had brought with him brand new radio sets that he found nicely packed in crates when he first arrived in Lhasa. 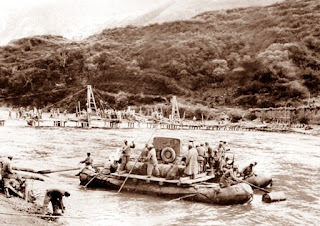 During World War II, when the Burma road was closed, the Lhasa government had authorized two Americans to proceed with a reconnaissance mission seeking possible supply routes between China and India. To thank the Tibetan Government, the President of the United States had sent three radio sets which were still packed in their crates in 1948. Many officials in Tibet were not keen to have foreigners operate these sets, but as no Tibetans had yet been trained to use them, they remained packed up in crates. From Chamdo, Ford soon established a daily link with Lhasa. He was also able to monitor the world news from Beijing and Delhi. Soon after his arrival in Chamdo, one of Ford’s first tasks was the training of some young Indians of Tibetan stock who would be able to operate the radio sets. The idea was to send them to the Sino-Tibetan border to monitor the movements of the Chinese troops. This border which had been ‘shifting’ during the past decades and even centuries, was now situated some one hundred miles east of Chamdo and followed the course of the Upper Yangtse. It is difficult to ascertain the true number of Tibetan troops stationed on the 200 mile long border along the banks of the Yangtse , Goldstein speaks of about 3,500 soldiers, but Ford estimated their strength to be much less. 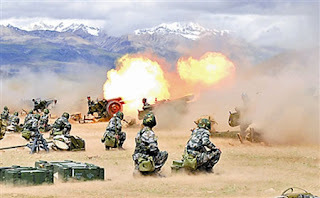 Whatever might have been the number of Tibetan soldiers, they were no match for the Second Field Army led by the Political Commissioner in Sichuan. On the other side of the great river more than 40,000 much better equipped troops waited to ‘liberate’ Tibet. 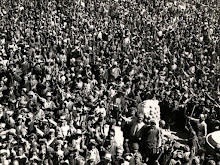 One of the major problems faced by the Tibetans was the lack of unity between the local chieftains and the Lhasa government. It was not a new problem but a heavy toll would be paid for the antagonism between Lhasa and the Khampas at this crucial point in the history of Tibet. On October 11 at 11 p.m., Ford had just finished speaking to his mother in England on the radio and was preparing to go to bed, when he heard a faint tinkle of bells coming from the east. “As bells grew louder I heard another sound, the clip-clop of horse’s hoofs.” Ford added, “…it passed my house on the way into the town. I saw the rider’s fur hat and the silhouette of the barrel of his riffle sticking up above his shoulder.” Ford immediately recognized an Army messenger riding towards the Residency where Ngabo Ngawang Jigme, the new Governor of Kham was staying. Gangto Druga was on the main trade route between Kangting and Chamdo. A Tibetan garrison was posted there. Five days had already passed since the Chinese began the ‘liberation’, but for reasons known only to himself, Ngabo Shape had refused to spare a radio set for the border post to monitor the advance of the Chinese troops. “Your Excellency, the spare portable radio is ready to go out at the shortest notice”, Ford told Ngabo, indirectly suggesting that a radio should be sent to the border. ”Good, Please keep the batteries charged,” replied Ngabo. “They are always fully charged. 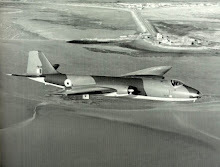 Either or both of the Indian operators are also in constant readiness to go out,” hinted again Ford. “Very good, we may need to send the station at any time,” answered Ngabo. That day Ford did not want to leave the Residency without getting a clear answer about Riwoche: “Would you like me to send the radio to Riwoche now, Phodo?“ the Governor finally asked. “Yes, Your Excellency,” said Ford. This discussion summarized the Tibetan world view. Unfortunately for them, the world had changed and the consequences would soon be tragic for old Tibet. Ngabo was not a military strategist and he could not have known about the conversation between Stalin and Mao. But at the time of this conversation, the Chinese Liberation Army had already attacked on many fronts. The main border post at Gamto Druga had been overrun by the Chinese who used the same strategy as in Korea. Wave after wave of soldiers soon overpowered the Tibetan defenders, who fought well but were finally massacred. In the meantime another Chinese regiment crossed the Yangtse above Dengo and advanced rapidly towards Dartsedo (Jyekundo), marching day and night. In the South, the 157th PLA Regiment crossed the Yangtse and attacked the Tibetan troops near Markhan. When they reached Markhan, the local Tibetan Commander, Derge Se, surrounded by the Chinese troops, surrendered his force of 400 men. Poor Ford! He had planned to use the southern route to escape. Now this route was also cut off. The net was slowly closing on Ford and on Tibet. The northern front lost ground day by day and the headquarters of the central zone was soon lost to the waves of young Chinese soldiers. 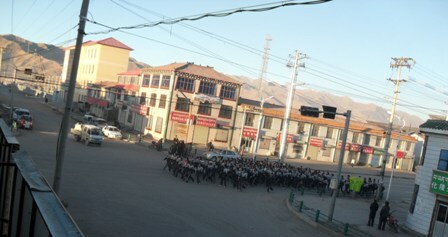 They caught the fleeing Tibetans at night in a place called Kyuhung where the Tibetans were decimated. The road to Chamdo was open. Lhasa was finally informed on October 12 that the Yangtse had been crossed and that the Chinese had began to ‘fulfil’ their promise to ‘liberate’ the Roof of the World. At the same time, the opera season was in full swing in Lhasa. The aristocracy and the Government were busy. For the Tibetan officials opera and picnic were sacred! “The gods are on our side,” was the most often repeated mantra in the town. The greatest excitement in Chamdo was the latest divination that Shiwala Rinpoche, the head lama of the local monastery, had just performed. It was on all tongues, the great news had spread like wildfire: “Shiwala Rinpoche says that the Chinese will not come.” Everywhere there was a sigh of relief. The Gods had won! The Dalai Lama discovered later that the letter was Ngabo’s telegram informing the Regent that the first outposts near the Yangtse had fallen. In the circumstances and keeping in mind the deep division between the Tibetans from Lhasa and the Khampas, what could have been done? Perhaps as the Tibetans themselves explain, the Karma of Tibet had ‘ripened’ and nothing or nobody could stop it. But Deng Xiaoping, Liu Bocheng and their men were used to hardship and bitterness. They had gone through worse when the Nationalists were trying to catch up with them during the Long March. It was without doubt easier for the People’s Liberation Army to fight ill-equipped Tibetans than the sophisticated weapons of McArthur’s troops in Korea on the eastern front. In the meantime, Ford was trying to catch the latest world news on his wireless, but there was nothing about Tibet. One of the greatest dramas of the twentieth century was unfolding without anyone knowing it. When the world heard of it, it was already too late. Lhalu, the previous Governor of Kham had already left and though still in radio contact with Chamdo, was now out of reach for the Chinese. Over, the next few days, many Tibetan officials came to Ford’s radio station to try to hear the reaction of Lhasa, thinking that the Kashag would immediately appeal to the world community for help. They expected Lhasa to respond quickly before it was too late. But nothing! Nobody could understand what was going on! One day Ford went to Ngabo to show him the news summary and he was reassured by the Governor not to worry. The Tsongdu and the Kashag were deliberating and once a decision was taken, it would be announced. Finally about 10 days after the Chinese had crossed the Upper Yangtse, Ford heard an announcement from Delhi: Shakabpa and the Tibetan delegation were denying any attack on Tibet. My article on Hu Hsu, the Chinese 'pilgrim' appeared in The New Indian Express this morning. His 101st birth anniversary is celebrated today. He was a great human being and a yogi, not running for publicity and recognition. Click here to read. 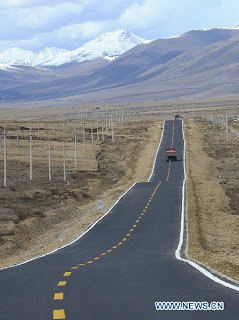 While India is busy with the postmortem of the Games, China is working hard to develop a modern infrastructure of roads, railway line and airports in Tibet. 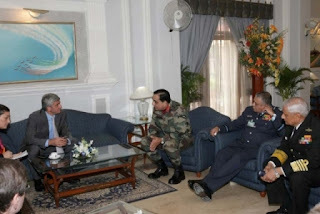 It is irritating as the Chief of Army Staff recently said: "We have two irritants. One, mainly in terms of how the situation is, in Pakistan where there is a problem of governance, where there is certain amount of support that is being given to some terrorists and where the internal situation is not very good, ....Similarly, we have a rising China, both economically and militarily. Although we have CBMs in place, although we have a very stable border, yet we have a border dispute." In the meantime, the government continues to 'appease' China. DNA reported: "Anticipating the matter to come up in talks between prime minister Manmohan Singh and his Chinese counterpart Wen Jiabao in Hanoi, Vietnam, on October 29, the government has told Delhi-based Jamia Millia Islamia University to suspend conferring an honorary doctorate on Tibetan leader in exile the Dalai Lama. Dalai Lama was to get the honour in November. The government obviously does not want to create further tension." 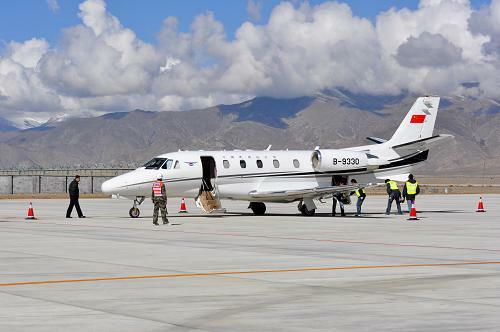 LHASA, Oct. 21 (Xinhua) -- The fifth civil airport in China's Tibet Autonomous Region will open early next month, civil aviation authorities said Thursday. Xigaze Peace Airport, located in Xigaze Prefecture, 48 km from Xigaze City, is 3,782 meters above sea level. The airport terminals, decor, facilities and flight tests were completed, allowing it to officially open in early November, said Zhu Feng, secretary of the airport's Communist Party of China (CPC) branch. However, Zhu said, no exact date had yet been set for the opening. Construction, with an investment of 489 million yuan (74 million U.S. dollars), began on April 29 last year. The airport is expected to have handled 230,000 passengers and 1,150 tonnes of cargo by 2020, according to the Civil Aviation Bureau of Tibet Autonomous Region. Tibet has four other civil airports in Lhasa, Nyingchi, Qamdo and Ngari. In the past five years, China has invested heavily in building transport infrastructure in Tibet, pouring money into construction of highways, railways and airports to stimulate Tibet's weak economy and tourism. The inauguration ceremony of Chamdo West Road is held at the newly built Conference Center in Chamdo Prefecture, Tibet Autonomous Region (TAR), photo taken on Oct. 21 by Drolma from China Tibet Online. 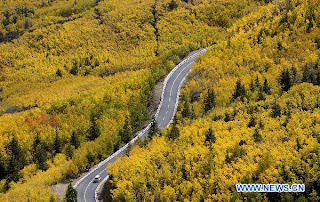 On Oct.21, the ceremony marking the completion of Chamdo West Road renovation project was held in Chamdo Prefecture, Tibet Autonomous Region (TAR). Chamdo West Road, the main road in Chamdo County, takes on a modern look after the 6-month renovation. "The Chamdo Conference Center is not only a key project dedicated to the 60th anniversary of the liberation of Chamdo, but also a project (including the construction, installation and decoration) of an extra aid-Tibet project with the fund allocated by the Prefectural Party Committee and Prefectural Government. The Center covers an area of 18036.4 ㎡with a total investment of 99 million yuan. The construction of the center formally broke ground in June 2009 and was completed in Aug. 2010. As the host to various important events in Chamdo, the center is composed of a conference hall of 750 pax, a ballroom of 350 pax, Video Conference Rooms, etc. " said Wang Wei, Secretary General of Chamdo Local Administrative Office. 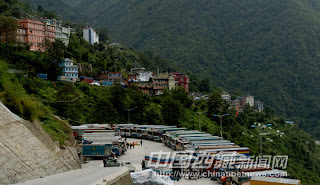 The renovation project of Chamdo West Road started on April 28th, 2010 with a total fund of 32.6 million yuan. 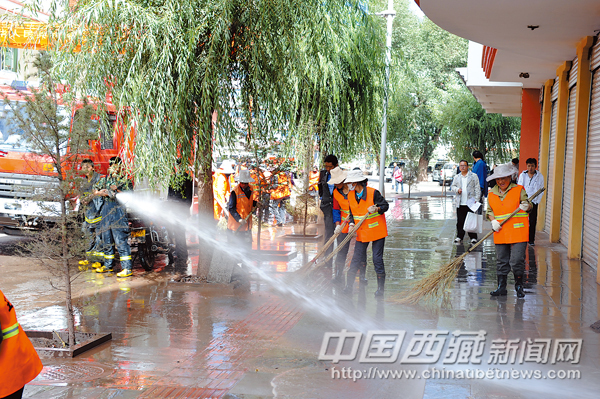 The project included painting 39 buildings along the street with a total construction area of 88295 ㎡, fixing outdoor stairway of 2568 ㎡, decorating buildings and side walks, reinforcing guardrails, etc. "Extending along dilapidated houses, the street used to look very old and shabby. Thanks to the renovation, the environment of the urban area has been improved with accessible transport facilities,"Dawa Tsering, the 55 year-old citizen of Chamdo, said happily. Photo shows the newly opened parking lot at Zham Port, Shigatse Prefecture, southwest China's Tibet Autonomous Region (TAR),photo from Tibet Daily. The first parking lot was recently opened at the Port of Zham of Nyalam County, Shigatse Prefecture of southwest China's Tibet Autonomous Region (TAR). With an overall area of 12,000 square meters, the parking lot cost 18 million yuan and is expected to hold over 300 trucks. The new facility has largely improved the infrastructure of the Port, ensuring further development of the local border trade. In the past, there wasn't a large parking lot at Zham Port and its development was restricted somewhat by traffic congestion. 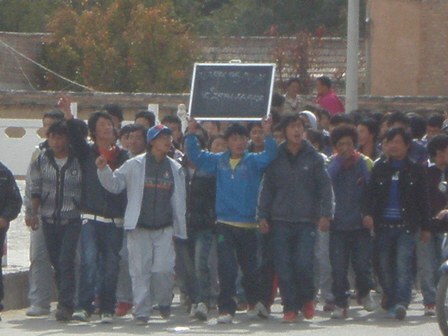 Two years after the unrest of March/April 2008, the Tibetans of Amdo (Northeastern Tibet) are again in the streets. 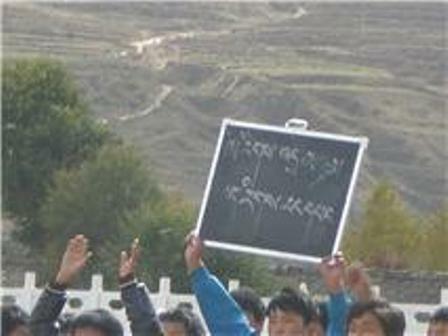 This time, it is the young students who demand a proper curriculum in Tibetan language. These few photos are impressive. By the way, it needs more courage to demonstrate in Rebkong or anywhere in Tibet than in the streets of Paris. This reminds me of a recent interview with the Dalai Lama. He spoke about the problem of curriculum. "More than 10 years ago, when Chen Kuiyuan was Party Secretary in Tibet [1992-200] , at a Party meeting, he mentioned that the ultimate threat to China (its separation from Tibet) is the Buddhist faith of the Tibetans. Two weeks ago [interview took place in April 2010], I was in Switzerland, I met some Tibetans. They know very well about the Tibetan University in Lhasa; they told me that the level of Tibetan studies before Chen Kuiyuan was quite good. After Chen became Party Secretary, it changed. The Tibetan texts were banned. Only the Chinese curriculum was allowed and translated into Tibetan; the courses were [conducted] according to this curriculum. Chen Kuiyuan saw the unique Tibetan culture heritage as a threat to separate Tibet from China. So, he systematically eliminated Tibetan [culture] from Tibet. This is one thing. Then, last year, I met a Tibetan who has settled in Australia and visits Tibet from time to time and brings money to build schools in his native place. Last year, after he returned, he told me that one of his friends who works in the education field told him the present Party Secretary [Zhang Qingli] convened a meeting of Han officials only. The Central government had asked Zhang to make some suggestions. In order to make these suggestions, he convened this meeting with Han officials only. For the education, they made the [following] suggestions to the Central Government: Chinese language should be the first language; it should be taught from Kindergarten. 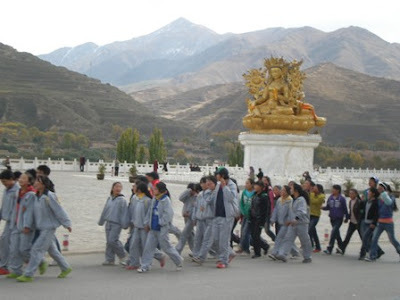 Then, all schools should emphasize about learning the importance of China and all monasteries should become like in the mainland, just museums with very few monks as caretakers. Zang Qingli made these three suggestions. The Chinese faced so many problems from the monasteries in March 2008. This meeting was held in 2009 to suggest a new education policy with these three points. If it is true or not, I have no way to cross-check [my information]. When someone asked the Dalai Lama if the term ‘cultural genocide’ used by him was not too strong, he explained that when he mentioned about 'cultural genocide': “I did not speak of strict ‘cultural genocide’, it was ‘conditional’, I said ‘a sort of cultural genocide’. Two things: one, as mentioned earlier, officially, there is a lot of restrictions about Tibetan studies. When Chen Kuiyuan was there, whatever had a religious meaning was removed [from the curriculum]. Then when Jiang Zemin came, new restrictions [were put in place]. Before Party officials could have [in their house] an altar with some Buddha statues; they usually had an excuse like, “my old mother likes this statues”; although they are supposed to be genuine Communists, non-believers. When Jiang Zemin became Chairman, it was not possible anymore. In the meantime, some very high Chinese Party officials, including from the PLA had my picture on their mobile, the Demon’s picture! [laughing]”. As long as the hardliners continue to rule China, the Tibetan issue will never be solved. 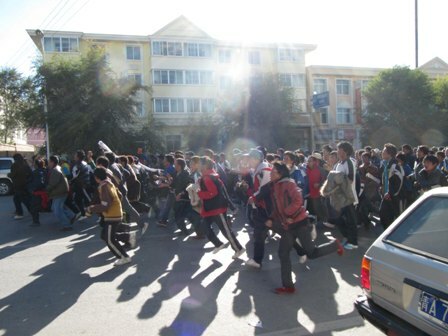 Following large protests, Chinese authorities dispatch security personnel to Tibetan areas. HONG KONG—Chinese authorities in the remote western province of Qinghai dispatched large numbers of security personnel to Tibetan areas following large-scale student protests over education policies this week. 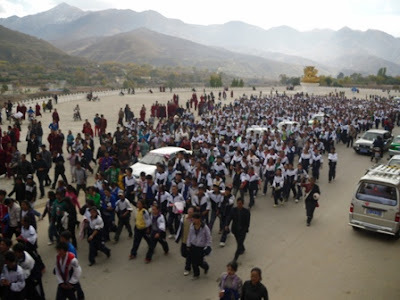 Local sources said thousands of Tibetan high school and college students took part in the demonstrations on Monday and Tuesday in Tsolho (in Chinese, Hainan) and Rebkong (in Chinese, Tongren) amid fears they will be forced to adopt a Chinese-language-only curriculum. An official who answered the phone at the Rebkong county education department said there were no demonstrations on Thursday. "Things are calm now," she said, but declined to comment further. "You should ask my boss these questions," she said. 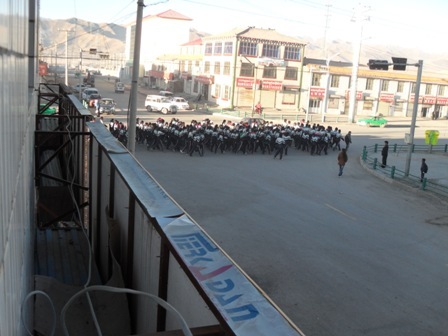 A monk at the Longwu temple who took part in the demonstrations said there were dozens of army vehicles and personnel still on the streets Wednesday, according to exiled Tibetan sources. "There are large numbers of them, but we can't be sure of the exact number," said Dzoege, a researcher at the International Campaign for Tibet. "We only know that there were between 20 and 30 army trucks." 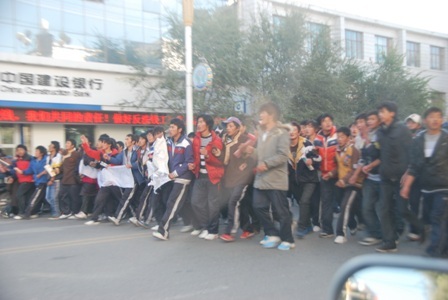 The protest began on Tuesday, sparked by students from the Tongren County No.1 Middle School. They shouted slogans such as "Racial equality! Free education!" as they marched. 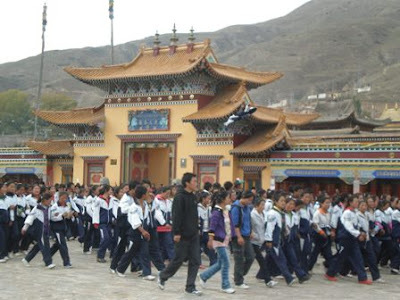 The monk said that when he and others from the Longwu monastery joined the march, some of the teachers at the scene objected, saying the issue was an educational one, not a political one. An official who answered the phone at the Rebkong country education department said that all the top-level officials were out dealing with the incident. Authorities on Wednesday moved to calm tensions as the protests spread. A local governor addressed students and assured them that the Tibetan language would remain in the school curriculum even though an official document said the Chinese language would be the main language of instruction. The education department official said the authorities had not backtracked on the plan to use Chinese in schools. "No, we haven't [changed our language policy in response to the protest]," she said. "Classes are still running normally," she said, adding that the high school students who protested were "unlikely" to be punished for taking part. Calls to the Rebkong county police department went unanswered during office hours on Wednesday. An employee who answered the phone at the Telecommunications Guesthouse in Rebkong's county seat said the march was not as large as 1,000 students. Estimates of protest size given by Tibetan sources ranged from as low as 1,000 to as high as 5,000-8,000. "There weren't very many people. They were all from a single school," she said. "Before, Tibetan was the main medium of instruction, and now it will only be an available subject, and Chinese will be the main language of instruction." "That's why they are kicking up a fuss." A local resident surnamed Lan said Chinese had been the main language of instruction in all the schools he had attended in the region. "There is a school here which specializes in Chinese-medium teaching, and one which specializes in Tibetan-language instruction," Lan said. "You can be taught in Tibetan or Chinese from year one, as if it's your native tongue." "A lot of the Tibetans here are herders. Of course they can't understand Chinese," Lan added. U.S.-based Chinese political analyst Wang Juntao said a number of misunderstandings had occurred between Tibetans and Han Chinese during the Tibetan unrest of 2008. "We all know that the language you use to teach people in a given country or region is a clear sign of ethnic identity," Wang said. "If all the teaching gets done in Mandarin, with Tibetan relegated to the status of special subject, then that's probably going a bit far," he said. Dawa Tsering, spokesman for the Tibetan government-in-exile based in northern India, said the Chinese government appeared to be in the process of "otherizing" different ethnic groups in China. "There has been a long-running dissatisfaction of this kind in Tibet," he said. "Now, some Tibetan students are standing up ... because previously they were teaching dialectical materialism and Marxism ... but they were doing it in Tibetan." "The Chinese government can't tolerate this," he said. "There is a direct connection between [this protest] and cultural and religious freedoms." The Dalai Lama, who fled Tibet in 1959 after a failed uprising against Chinese rule, has accused Beijing of perpetrating "cultural genocide" in Tibet. 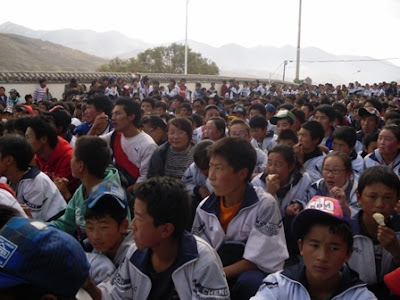 Beijing has run a high-profile "patriotic education" campaign among Tibetans since unrest spread across Tibetan regions from Lhasa in March 2008, requiring local people to denounce the Dalai Lama, whom the government rejects as a "splittist." Original reporting in Cantonese by Bi Zimo, and in Mandarin by Tang Qiwei and Qiao Long. Translated and written in English by Luisetta Mudie. There is an interesting debate in China today: was Wen Jiabao, the Chinese Premier 'putting on a show' when he spoke about democratic reforms in Shenzhen in August or more recently in the US (in an interview with Fareed Zakaria for CNN). Due to the extreme opaqueness of the regime in Beijing, the question is not easy to answer. In another interview, he affirmed: “they share the same goal, which is to strengthen their power base. I think they have more in common than differences. That's why I don't agree with the unrealistic view held by many Western scholars and China observers, as well as many Chinese people, that Wen is a reformist, that he is more open." Well, this does not help. We will probably have to wait a few decades to know who the real Wen is. One thing is however certain: Wen will retire in 2012/2013. Further, whether he speaks his mind or put on a show, nothing will happen to him after retirement because too many people in China believe reforms are necessary. The fact remains that the Premier of the State Council (Prime Minister) is today being censored. Living in a democracy, it is difficult to imagine a Prime Minister not free to speak his mind or portions of his speeches deleted by an all-powerful Publicity Department. There is a more interesting side to Wen's declarations: it brings a new dimension to the on-going discussion/debate on what is supposed to be a smooth leadership transition in 2012. A few months ago, most of the observers had already 'guessed' who would be the Middle Kingdom’s new leaders, not only in 2012, but also in the 2020’s. For Hu and his colleagues of the Standing Committee of the Politburo, it may now only be wishful thinking since two new factors have crept into the scripted play. One: the 2010 Nobel Peace Prize has been awarded to Liu Xiaobo, the initiator of the Charter 08, a text signed by 300 prominent intellectuals, suggesting the introduction of some democratic reforms into the opaque one-party system of China. As the Communist Party met last week to decide the next five-year plan and discuss China’s future, Beijing prevaricated on the fate of the new laureate; interestingly, Lui’s award has become a divisive issue in the precarious political equilibrium within the Party. Two: I already mentioned the publication by a group of former senior officials of strongly worded open petition addressed to top legislative body, calling for an end of media censorship. In the years to come, China is bound to witness new demands for the ‘fifth modernization’ dear to the intellectuals who wrote large posters on the Democracy Wall of the Tiananmen Square in 1979 (Deng Xiaoping had spoken of 4 modernizations). Today these Elders (who probably participated to the censure of the Beijing Spring thirty years ago) asked for free speech, which, they believe is enshrined in the 1982 constitution. The points raised by them cannot simply be swept aside. Wen’s utterances on democracy demonstrate that there is probably today another faction in the power struggle for the 2012 succession. The main factions may remain the Communist Youth League Clique (lead by Hu Jintao) and the Gang of Princelings (lead by Xi Jinping), but a 'reform faction’ seems alive and may even have some ‘popular’ support. It is true that the present apparatchiks have no originality of thinking; most of them are obsessed with the China Model. The Party may consider the China Model as “a multi-dimensional system that covers almost every aspect of China’s development. It includes political, economic, cultural, social, and military sub-models”, but it appears again wishful thinking from the leadership. However within China (and even within the Party) many believe that there are possibilities of ‘reforms’ and it is necessary if China really wants to build the harmonious society so dear to President Hu. Is the ‘reform gang’ strong enough to tilt the balance and bring about real changes in China? Only the future will tell us. Could the Nobel Peace Prize to Lui Xiaobo, which was an 'embarrassment' for the Party, trigger the 'reform' faction to come in the forefront? It appears that during the recent Plenum of the Central Committee of the CCP, the question was not raised, but it is difficult to know what is going on in the corridors of Zhongnanhai. In the 2012 succession race, one should forget another faction: the People’s Liberation Army. In the recent months, the Army has shown that it can influence China’s foreign policy; we have seen it for policies vis-a-vis the US, Korea or Japan. 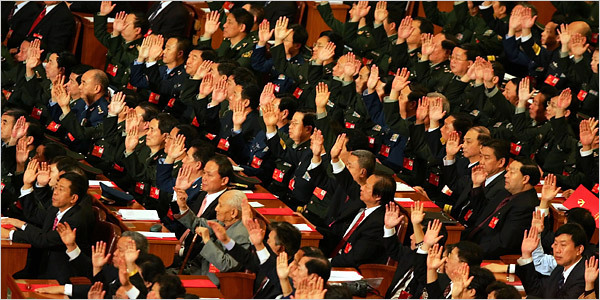 The PLA clique will probably fight hard against the introduction of 'political' reforms into the party-unique system. Ironically even amongst the generals there are 'reformers'. General Liu Yazhou, Political Commissar of the National Defence University recently declared: "The secret of US success is neither Wall Street nor Silicon Valley, but its long-surviving rule of law and the system behind it... Democracy is the most urgent; without it there is no sustainable rise. Ideals of democracy are not restricted by national borders, or by historical ones." Everything is not only opaque, but it is complicate. In the meantime the Plenum of the Central Committee of the CCP has appointed Vice-President Xi Jinping as a Vice-Chairman of the Central Military Commission. It means that he will step in Hu’s three pairs of shoes in 2012 (PRC President, General Secretary of the Party and Chairman of the Military Commission). Xi Zhongxun was one of the architects of the economic reforms. He proposed and implemented Shenzhen, China's first economic zone which later became the standard model for the other economic zones. Will the Son emulate the father by introducing political reforms? An interesting two years lie ahead. Have you heard of Xu Fancheng? Never heard of him? You are not the only one. Those who visited the Pavilion of Puducherry at the World Exhibition in Shanghai may have come across a panel depicting Xu Fancheng’s amazing odyssey in India: ‘The key man in cultural exchanges between India and China’ as one panel depicts him. This assertion might be true, but strangely enough, he is unknown in India; even the South Block Mandarins, always quick to find living symbols of the Chini-Hindi brotherhood, are unaware of him. Ironically, it is a Communist publication, The China Daily (the largest English-language newspaper in the mainland) which first paid homage to the great scholar, artist and spiritual seeker. It is worth quoting a few more lines from the Chinese newspaper: “In ancient times, Chinese scholars used to travel to India to study Buddhism and to bring back Buddhist scriptures, some of which have been well documented in history. But Xu spent a much longer time there than any of them, although he did not have to walk or ride horses and camels across deserts and snow-capped mountains to reach his dreamland”. But who was really Xu Fancheng or Hu Hsu as he is still remembered in Puducherry? Hu Hsu was born in Changsha, in the southern province of Hunan on October 26, 1909 into a well-off family. At that time, even though his family was involved in business, it was the normal practice for boys to get a classical education in literature and arts. The discreet Xu once told one of his friends in the Ashram that Mao Zedong had been his history teacher in primary school. It is a fact that in 1917, the future Great Helmsman founded a night school in Hunan. 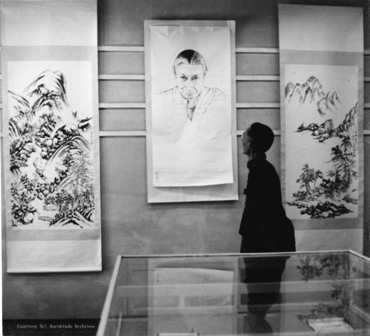 Later Mao was later appointed assistant librarian at the University of Beijing. It is probably around that time that Xu met him this ‘very good teacher’. Unfortunately for China, Mao’s destiny was not to remain a ‘good’ teacher. A few years later, the young Xu came into contact with Lu Xun, one of the most prominent Chinese writers in the 1920’s and 1930’s. Lu had a large following among young intellectuals and is still considered today as the founder of modern Chinese literature. The two became friends. 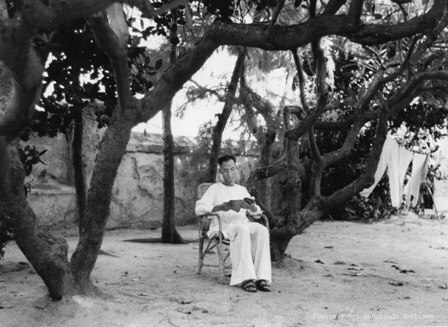 Hu Hsu continued his studies at the Sun Yat-sen University in Guangdong. Interestingly the university’s motto was: "Study extensively; enquire accurately; reflect carefully; discriminate clearly; practice earnestly". During his entire life, Xu Fancheng faithfully followed this path. He later moved to the Fudan University to study Western Literature. 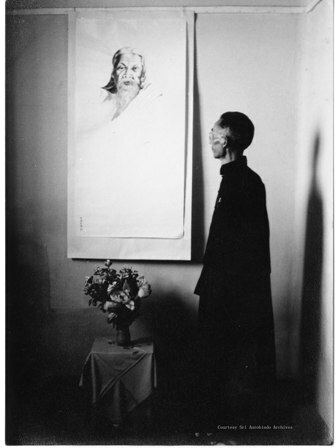 In 1929 with Lu Xun’s support, he obtained a scholarship to study Fine Art and Philosophy in Heidelberg, Germany where he stayed 3 years. He came back to China in 1932 where he started to translate the works of Nietzsche into Chinese; soon becoming a Nietzsche expert. In 1945, at the end of the WWII he decided to come to India. 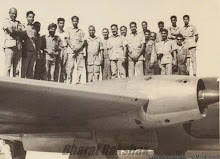 Flying from Kunming to Calcutta was an adventure in itself (during the war, 594 aircraft were lost, missing, or written off and 1,659 personnel killed or missing). But this was nothing for the young spiritual aspirant. 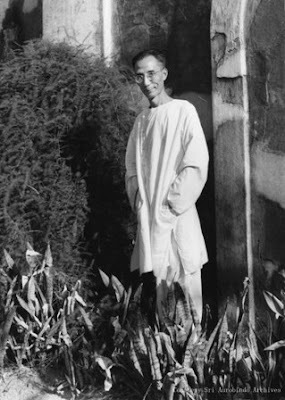 For several years, he lived in Visva-bharati in Santiniketan studying Sanskrit while teaching the History of Chinese Buddhism at Cheena Bhavana, the centre co-founded by Rabindranath Tagore and Tan Yun-shan in 1937. It is at Tan’s initiative, let us not forget, that Jawaharlal Nehru visited China in 1939. A close friendship and mutual respect is said to have been forged between the two thereafter. It is probably Tan who spoke about Sri Aurobindo and his Ashram to Xu Fancheng. 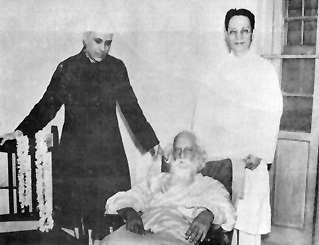 In 1939, after having visited the Ashram and meeting the Mother, Tan had Sri Aurobindo’s darshan. He later wrote: "...As in the past China was spiritually conquered by a great Indian, so in the future too she would be conquered by another great Indian, Sri Aurobindo, the Mahayogi who, is the bringer of that light which will chase away the darkness that envelops the world today." In 1951, Xu landed in Pondicherry. He remained there for 27 years, deeply immersed into studying, painting, teaching, translating, writing or simply being an ‘integral yogi’. He translated into Chinese several Indian classics such as the Bhagavad Gita or the Upanishands, but also the major works of Sri Aurobindo, particularly The Life Divine. It is Xu who organized the first Chinese printing press in Pondicherry with the Mother’s support. The death of Mao Zedong in September 1976 heralded a new era for China and the world. Those who had suffered the brutal repression of Mao’s policies began dreaming of a brighter and more peaceful future. On December 18, 1978, hardly two years after the end of the Great Proletarian Cultural Revolution, a small man (in size) climbed the rostrum for the Third Plenary Session of the Eleventh Central Committee of the Communist Party of China. Deng Xiaoping was to change the face of China. The same year, Xu decided to return to China and worked as a researcher in the Department of Religion in the Chinese Academy of Social Sciences in Beijing. He continued to work quietly until he passed away on March 6, 2000. Can you believe that it is The China Daily which asked: “Why are an old, lonely scholar born a century ago and the stuff that used to be called ‘Oriental mysticism’ and spirituality, drawing people's attention today when most students in China and India are being taught Western rationalism?” and then adding: “When Xu was pursuing his vocation single-mindedly, Chinese youths were flocking to Western countries' embassies or consul offices to apply for student visas”. Thirty years ago, though Deng Xiaoping announced that ‘to be rich is glorious’, the masses’ lives still remain hollow; it is perhaps time for China to meditate on the life and contribution of the last Chinese pilgrim. Hu Fancheng has definitively a message to teach to China's youth. Soon after Jiang Qing, the disgruntled Chairman’s widow and her colleagues of the Gang of Four were removed from the scene, one of the leaders who had several times been ‘purged’ and in disgrace for several years, was back in the center of the political stage, Deng Xiaoping. On December 18, 1978, hardly two years after the end of the Great Proletarian Cultural Revolution, the small man (in size) climbed the rostrum for the Third Plenary Session of the Eleventh Central Committee of the Communist Party of China. Deng was to change the face of China. The new strong man of the Middle Kingdom proposed to the Central Committee an ‘open door’ policy as well as drastic economic reforms. Thirty years later, China celebrated what Xinhua terms the “decision to open up the once-secluded country and reform its moribund economy”. The new path chosen by Deng would later be known as “socialism with Chinese characteristics”. Since then China has maintained an average annual growth rate of 9-10 % and this over the past three decades, making the developed world dream of a miracle à la Chinese for their own economies. The years which followed Deng’s return were years of hope for the people of China who had greatly suffered during the different campaigns of Mao. One of the examples of the new wind blowing over China was the Beijing Spring in 1979 and the freedom slogans written by Wei Jingsheng and his colleagues on the Wall of Democracy in Beijing. For the so-called ‘nationalities’ and particularly the Tibetans, the last two years of the 1970’s also became an era of relative freedom. One soon started seeing the first signs of detente in China as well as in Tibet. For many, the arrival of the pragmatic Deng Xiaoping in power could only augur positive changes. The Panchen Lama, the second most important Tibetan religious figure after the Dalai Lama and Bapa Phuntso Wangyal, the ‘first Tibetan Communist’ who led the Chinese troops into the Tibetan capital in September 1951 had been released after more than 15 years in Chinese jails. They had managed to survive in the most inhuman conditions. The return of Deng had other consequences, many Chinese who lived abroad returned to China. 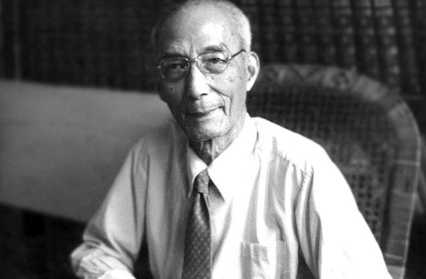 One of them was Hu Hsu, also known as Xu Fancheng (1903-2000). I am posting here a remarkable article published by The China Daily in December 2009. The author points out: “In ancient times, Chinese scholars used to travel to India to study Buddhism and to bring back Buddhist scriptures, some of which have been well documented in history. But Xu spent a much longer time there than any of them, although he did not have to walk or ride horses and camels across deserts and snow-capped mountains to reach his "dreamland". The article goes into the extraordinary journey of Hu Hsu. This year, we are celebrating Hu’s centenary.Though he was a great master of classical Chinese poetry, calligraphy, sculpture, and painting; though he knew eight ancient and modern languages; though he translated the Bhagavad Gita, the Upanishads and the major works of Sri Aurobindo into Chinese, how many know of him in India today. Read The China Daily article. Wars, famine, state failure, revolutions, reform, economic boom. Most people in the world cannot think of much else when it comes to 20th-century China. To be honest, even most Chinese cannot think beyond them. They cannot imagine that a scholar from a society of constant upheavals could find a place to immerse himself in his quest for spirituality and life's meaning. But that is exactly what Xu Fancheng (1903-2000), a leading researcher with the Chinese Academy of Social Sciences (CASS), did in India. In ancient times, Chinese scholars used to travel to India to study Buddhism and to bring back Buddhist scriptures, some of which have been well documented in history. But Xu spent a much longer time there than any of them, although he did not have to walk or ride horses and camels across deserts and snow-capped mountains to reach his "dreamland". For 33 quiet and, for most part, penniless years, Xu worked as hard as the ancient pilgrims, studying and translating India's classical and modern writings. He was unaffected even by the loss of family members and the change of the national government back home. He spent most of those years in Sri Aurobindo Ashram, an education center founded by Aurobindo Ghose (1872-1950) and led by Mirra Alfassa (known as the Mother, 1878-1973), in Pondicherry, southern India, where he started translating some of Ghose's key philosophical works. It was not until 1978, when a friend from Hong Kong convinced him that China was beginning to reform and open up and might make room for his intellectual quest, did he think of returning home. When he arrived in Beijing, as his former CASS assistant Sun Bo recalls while talking to China Daily, "the old scholar had nothing except a little money from his Hong Kong friend no company and no personal belongings other than his manuscripts". Nor was there a homecoming ceremony, like the one presided over by the emperor when the famous Tang Dynasty monk Xuanzang (602-664) returned from his 17-year study tour to India. After the long absence, the motherland seemed a strange place to Xu in many ways. Very few people could remember who he was unless they went through the Chinese editions of Nietzsche, some of which Xu had translated while studying in Germany in the 1930s. Or, they could find his name in the research on Lu Xun (1881-1936). Lu Xun had a large following among young intellectuals who, angry at the state of the country, went to him for inspiration and to get their articles published in his magazine. Xu was one of them. But like Sri Aurobindo, his Indian inspiration, Xu turned from being a radical young intellectual into a thinker, making Eastern philosophy his source of spirituality, something China shared with India in ancient times and could still be valuable for modern man's existence. And it will be more than being valuable, as we can know from Xu's writings and, more importantly, derive from his entire body of research. He re-emphasizes that man's inevitable journey from the industrial and bureaucratic systems of the modern times will be toward moral independence and spiritual well-being. As Xu has said: "In a way, the destiny of mankind has been determined by the philosophies of ancient Greece, India and China, each with its genuine and independent roots. Without those, neither the Eastern civilizations nor that of the West can be thinkable If there is any meaning of academic research, and if it is to provide any useful service to mankind, then it must be to prepare for the coming of a great future - by revisiting the profound lessons of the past." Xu was one of the scholars who, after being educated in the Chinese and Greek classics at home, had the luxury of spending a long time to focus on Indian philosophy and teachings. He had the longevity, too, which allowed him another 20-odd years to write about his experiences and thoughts without much interference. As his former CASS colleagues recall, Xu was exempted by leaders in his research institute from attending most of the staff meetings. Among the huge number of Xu's translations in Chinese are the Bhagavadgita, 50 of the Upanishads, and the major works of Sri Aurobindo (such as The Life Devine and Essays on the Gita) and the Mother, who incidentally was also his close friend. Xu lived alone in an apartment in a six-story building without an elevator in eastern Beijing till his death in 2000. Xu Fancheng's collected works, published in 16 volumes by the Shanghai Joint Publishing Company in 2006, show that he was not only a translator of Indian philosophical works. He was also an original writer, and even though most of his own creations are relatively short, they cover an extensive range, reflecting deeply on Confucianism, Taoism and Buddhism, as well as classical Grecian philosophy. But Sun Bo, Xu's assistant in his later years, says the collected volumes do not contain all of his works. Some manuscripts, particularly the last book he was writing on Buddhism, went missing after his death. Xu's death, incidentally, was a non-event like his return from India. But now, almost a decade later, his standing as a scholar of very high repute has grown across the country. His translation of the Upanishads has been reprinted twice, according to its editor Huang Yansheng, of the Chinese Social Sciences Publishing. The Upanishads primarily discuss philosophy, meditation and the nature of God, and form the core spiritual thought of and mystic contemplations of the four Vedas. In Indian philosophy terms, they are known as Vedanta(or the culmination of the Vedas). "We have orders not just from universities and libraries," Huang says. "There have been individuals, too, from various backgrounds (who have ordered Xu's translations). They call us either to ask where they can buy it, or to request us to buy a copy for them." Thanks primarily to Xu's efforts some Chinese universities have started teaching Sri Aurobindo's works, Sun Bo says. Indeed, on popular Chinese online search site Baidu.com (on the web as well as the news search) Xu Fancheng is no longer an obscure name. At least two biographies of Xu have been published as his life story and his translations of Indian classical text attract widespread intellectual attention. But why? Why are an old, lonely scholar born a century ago and the stuff that used to be called "Oriental mysticism" and spirituality drawing people's attention today when most students in China and India, as well the entire developing world, are being taught Western rationalism? When Xu was pursuing his vocation single-mindedly, Chinese youths were flocking to Western countries' embassies or consul offices to apply for student visas. It was a time when science and technology were considered the best formula to change China. Who would think of going to India to study philosophy in a dead language called Sanskrit when GDP is considered the best measurement of progress? says Yang Xusheng, a philosopher and professor of Sinology in the Renmin University of China. "As it has turned out, it is not a road (the GDP road) on which you can travel very far," Yang says. "It is also getting very crowded, especially because Chinese and Indians have started joining in. So we have a crisis. We have come to realize that seeing some of us become morally and spiritually hollow is as much painful an experience as seeing other people inadequately nourished and sheltered." Xu's research is unique, Yang says, for it reminds people that in order to seek a balanced life and economy, we have to go back to the questions raised by the first thinkers of our civilizations - the Chinese, Indian, and Greek - and to integrate all their inspirations. "Haven't you heard what Xu said he wanted to do but could not find the time for?" Yang says. "He had plans to translate the Bible and the Koran again to give Chinese readers a better translation of the holy books. And do you know why he wanted to do that?" Tsering Woeser is a courageous person. Despite the tight security in China, she never misses a chance to inform the readers of her blog of the situation inside Tibet. Woeser is one of the signatories of the Charter 08 drafted by the Nobel Peace Prize Laureate Lui Xiaobo. Her Chinese husband, Wang Lixiong has also written extensively on Tibet. He recently published a Road map of Tibetan Independence. He says: "This roadmap derives from the watershed. I had not taken the possibility of Tibetan independence into serious consideration before the incident in Tibet in 2008. It serves as the watershed that compels me to realize that Tibetan independence, for a long time being a fantasy, has turned into an emerging issue and reached the eyesight of the public. This change is brought by none other than the 'anti-secession' institutions in China’s bureaucratic system." "The Party ideology sees China, during the mid 19th to mid 20th Century, as a victim of Western imperialism. The Chinese consequently have remembered the humiliations, but have rarely considered China itself as an imperial power." One can only admire people like Woeser or Wang. They bring hope that tomorrow's China will be different and more open. Wang Lixiong who is apparently more free to move around than Woeser recently twitted with the Dalai Lama. Today, Radio Free Asia contributor and freelance Tibetan blogger Tsering Woeser was honored with the 2010 Courage in Journalism Award by the International Women’s Media Foundation at a ceremony in New York. However, Woeser, who is based in Beijing, has long been denied a passport from the Chinese government, and could not attend the ceremony held in New York’s Waldorf-Astoria Hotel to accept the award in person. Undeterred by orders and threats from official quarters, living under constant police surveillance, and subject to repeated attacks on her blogs and e-mail accounts, Woeser has persevered in reporting human rights abuses in the Tibetan region. Woeser continues to publish commentary on Radio Free Asia’s website and break stories about crackdowns in Tibet on her Chinese-language blog, Invisible Tibet. Because Woeser is a banned writer in China, her website is hosted abroad. In April 2009, The New York Times cited Woeser’s blog as one of the few reliable news outlets for those able to circumvent China’s Great Firewall. Unfortunately for Woeser, this recognition also means living with risk. Sources and friends with whom she speaks are subject to detention and interrogation. Woeser originally was a reporter and eventually became an editor for a government-controlled Tibetan literary journal. 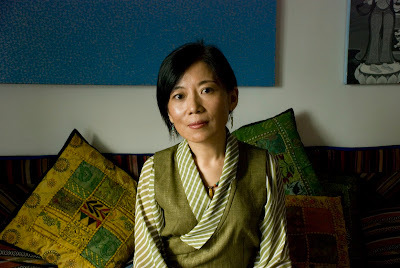 After the publication of her best-selling book Notes on Tibet, which was banned in late 2003, Woeser was told by authorities to change her point of view in order to keep her job. She refused. Woeser then moved to Beijing and began blogging. In a 2006 interview with Radio Free Asia, Woeser said she would never stop writing. Terror out of Africa is the title given to my article on the al Qaeda Organisation in the Islamic Maghreb today published in The Pioneer. Click here to read. My article on the new Nobel Peace Prize Laureate Lui Xiaobo, Why Beijing seethes over the Nobel for Liu has been posted on Sify.com. During the recent Plenum of the Central Committee of the CCP, Xi finally made it to the Central Military Commission. Hu Jintao would have not probably mind continuing for a few more years as PLA's boss, like his predecessor Jiang Zemin did, but the Party always decides. Did you notice that in 2012, both France and China will have professional singers as First Ladies (if, of course, Sarkozy is reelected). It could be an interesting duo. I am wondering if Xi Jinping has kept the Rolex watch given by the Dalai Lama to his father Xi Zhongxun in the 1950's. It is said that Xi Senior "was remembered for his friendship to his colleagues, his tolerance to diverse cultures and religions, his idealism of an open market socialist country and his integrity in his beliefs. He was one of the few upper level leaders who voted during the 1980s for open reform and was persecuted afterward for this bold move." Will Xi Junior follow the same path? Xi Senior was purged in the 1960's for having written a report on the Panchen Lama's 70000-character petition to Zhou Enlai. Mao did not appreciate the Panchen Lama's 'poisonous arrow'. BEIJING, Oct. 18 (Xinhua) -- Chinese Vice President Xi Jinping has been appointed vice-chairman of the Central Military Commission (CMC) of the Communist Party of China (CPC). The Fifth Plenary Session of the 17th CPC Central Committee announced in a communique at the close of the four-day meeting Monday that the CMC was augmented to include Xi as a vice-chairman. 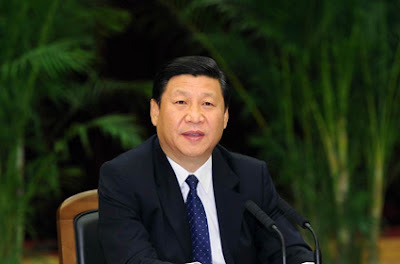 Xi is also member of the Standing Committee of the Political Bureau of the CPC Central Committee. Born in 1953, Xi has served in a number of positions related to the armed forces and military reserve affairs during his previous tenures at national and local levels. He was a military officer in active service when he worked as a secretary at the General Office of the Central Military Commission from 1979 to 1982. He served as the first political commissar and first secretary of the Party committee of people's armed forces department of Zhengding County, Hebei Province, from 1983 to 1985 when he was the secretary of the county's Party committee. Xi later served as the first secretary of the sub-military area commands' Party committees of Ningde and Fuzhou, both in Fujian Province, from 1988 to 1993. From 1996 to 1999, he served as the first political commissar of the anti-aircraft artillery reserve division of Fujian provincial military area command, when he was deputy secretary of the CPC Fujian Provincial Committee. In 1999, Xi became vice director of the commission for national defense mobilization of Nanjing Military Area Command and director of Fujian Provincial commission for national defense mobilization, when he was promoted to acting governor of Fujian Province. After a transfer to Zhejiang Province in 2002, Xi was appointed director of Zhejiang Provincial commission for national defense mobilization. When Xi was promoted to secretary of the CPC Zhejiang Provincial Committee, he was appointed the first secretary of the Party committee of Zhejiang provincial military area command. Xi was first secretary of the Party committee of Shanghai Garrison when he was transferred to serve as Secretary of the CPC Shanghai Municipal Committee in 2007. Guo Boxiong and Xu Caihou are the other two vice chairmen of the CPC Central Military Commission headed by President Hu Jintao. a major player in the region. It therefore, unquestionably, has an important role to play in Afghanistan. Mr. Hervé Morin was born on 17 August 1961 in Pont-Audemer, Eure (Normandy). He was reelected thrice since 1998 as an MP representing the constituency of Eure. He is leader of the New Center Party. After the presidential elections of 2007, his Party became an ally of the majority (UMP Party). He was later selected by President Nicolas Sarkozy to hold the important defense portfolio. 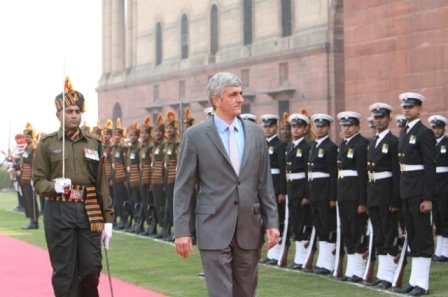 In an exclusive interview to the Indian Defence Review, the Defence minister answers questions by Claude Arpi on Indo-French relations, in backdrop of the forthcoming visit of the French President to India in December 2010 during which several agreements are likely to be finalised. Q: Hon’ble Minister, could you give us a brief overview of Indo-French defence relations? HM: We have a long-standing military cooperation. When India desired to diversify its military relations in the early 1980s, France responded and a relationship of trust was built, especially with the Mirage 2000s. In 1998, India and France decided to raise their bilateral relation to a strategic level. The establishment of an Indo-French strategic partnership enabled us to strengthen our ties further and join our voices at international bodies. Whether it concerns its candidature for a permanent seat at the Security Council or the amendment of regulations for civil nuclear energy exportation, India knows that it can count on France’s support. Since the beginning of our strategic partnership, a high-level defence committee has been meeting every year and other agreements have strengthened our bilateral relations. I would particularly refer to the founding of an annual forum on research and technology in 2002, and the signing of the Indo-French defence agreement in 2006. Further, joint military exercises are held every year between our air forces and navies. Our relation in all these areas has attained a high level of trust. Q: What are you expecting from the Presidential visit in December? HM: Last year, India was the Chief Guest for our national day parade on the Champs Elysées in Paris. On the occasion of Prime Minister Manmohan Singh’s visit to France, our two countries reiterated their resolve to give a fresh impetus to our strategic partnership. Our defence relations constitute one of its principal pillars. President Nicolas Sarkozy’s upcoming visit in December will make our partnership progress even further in all its facets, be it facing common threats, intensifying our operational cooperation, or bringing the projects for equipping the Indian armed forces, launched together, to their fruition. Q: What are the most important projects underway with India? HM: Our cooperation concerns the very heart of our security: counter-terrorism. This is even more indispensable as we often face similar kinds of threats in Afghanistan, in Europe and in India, as borne out by the attacks in Mumbai in November 2008. Further, we have a very promising operational cooperation, be it regarding anti-piracy operations, joint exercises or officer exchanges. With regard to defence equipment, the Indo-French relation translates into the supply of strategic equipment (fighter aircraft, submarines), and also state-of-the-art technology for the entire gamut of the Indian armed forces’ requirements. As our own history has made us extremely sensitive to India’s desire to favour local production and develop the defence industry, this relation has always been characterised by mutual trust and technological cooperation. As always, we are following the true course of a partnership. The chief project underway is the manufacture, under licence in India, of six Scorpene submarines at Mazagaon docks, Mumbai; it is a project to which we feel totally committed, alongside our Indian partners. Among other projects that have matured, one can cite the modernisation of the Indian Air Force Mirage 2000 fleet; two joint development projects - the Maitri project for a surface-to-air defence missile system, and the Kaveri fighter aircraft engine; the supply of reconnaissance and observation helicopters or, in the slightly longer term, the second phase of six submarines. Q: For more than 50 years France has been a trusted supplier of military equipment to India. India recently floated a tender for purchasing 126 medium multirole combat aircraft. What are your hopes for what is being called the “contract of the century” in India? HM: The Rafale is an exceptional aircraft, which meets the needs of the Indian Air Force particularly well. I am sure that the field trials, completed in spring 2010, would have enabled the Indian Air Force and the Ministry of Defence to gauge fully the quality of this aircraft, which the French Air Force itself is equipped with. I have also noted that the trials were conducted with great professionalism within the strict deadlines. As part of this partnership, we are, of course, extremely attentive to the comments or specific requirements that the Indian Air Force or the Ministry of Defence may send us. Q: Has the contract for refitting the Mirages been signed? HM: The acquisition of the Mirage 2000 in the early 1980s was a very important step in bringing India and France close together. In this spirit, I earnestly hope that the modernisation of India’s Mirage 2000 fleet will be executed by Dassault, Thales and MBDA. I am confident that the negotiation of this contract will reach a speedy conclusion. Q: What is the status of the Maitri project for joint development of surface-to-air missiles? HM: The Maitri project for joint missile development is mentioned in the political Joint Statement made in September 2008. It commits the French company MBDA, and the DRDO from India in an as yet unparalleled project, which will involve extremely ambitious transfers of technology. 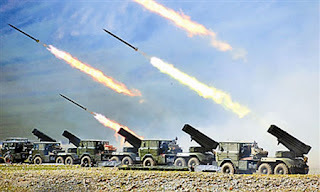 The anti-aircraft defence system developed in India, which will use this missile, will meet the requirements of the Indian Air Force and the Navy as well as that of the the Army, should the latter wish to join the programme. I am confident of the completion of this joint project, which perfectly illustrates the spirit of our strategic partnership as it implies the joint development of a new weapons system. Q: Do joint exercises like Garuda or Varuna contribute to improving interoperability between the Indian and French armed forces? HM: The Varuna and Garuda exercises, involving our respective Navies and Air Forces, are major manoeuvres that enable us to develop and implement new tactics, which can be directly used, for instance, to fight piracy. Q: How can the Indo-French strategic partnership be improved with regard to defence? HM: The President of the French Republic has emphasized on several occasions that the ties of the Indo-French strategic partnership contribute to stability and peace not only at the regional level but also at the global one. As I had the opportunity to say to the Hon’ble Minister of Defence, Shri A.K. Antony, during my visit in December 2009, we can go even farther in enhancing our consultations on the regional situation – I am specifically referring to Afghanistan, where France is engaged – but also on major international issues. We could also intensify our cooperation at the theatres of operation where both our armed forces are deployed, piracy in the Indian Ocean and the Gulf of Aden being such a case. Lastly, we could develop more armament programmes that are efficient and adapted to the needs of both armed forces. Q: Can one envisage France and India collaborating on a major joint project on research, development and production? India, for instance, already has such a project with Russia for a fifth generation fighter plane. HM: The Indo-French relation is one of trust. Therefore, France is fully ready to undertake major cooperation projects on armament with India. There already are two joint development projects: the Maitri missile project between the DRDO and MBDA, and the Kaveri engine that is to be jointly developed by the DRDO and SNECMA. We must together explore other possible areas for applying this renewed cooperation, accompanied by real transfers of technology. Q: What is your government’s policy vis-à-vis the sale of armament to Pakistan? HM: Pakistan is an essential partner for fighting terrorism. Our dialogue with this country, including the military sphere, has but a single goal: reinforcement of Pakistani military capabilities for fighting radical extremists. Q: How do you regard the evolving situation in Afghanistan today? HM: The objective of our engagement in Afghanistan has been the fight against terrorism and ensuring the stability of this country, which is essential for the security of the entire zone. At the request of the Afghan government and in the framework of United Nations resolutions, we have maintained a military presence since 2001, the priority being the training of the new Afghan army and police. With almost 4000 men deployed on the field, we are fully assuming our share of the responsibility. As reiterated by President Nicolas Sarkozy on several occasions, we will stand by the Afghan people for as long as is required. The presidential elections, and recently, the legislative polls, mark an important phase of the democratic process in this country, and we welcome the mobilisation and courage displayed by the Afghan people under particularly violent and tough conditions. With the support of the international community, the new Afghan authorities must henceforth formulate and implement a programme capable of meeting all the challenges that this country faces: security, governance, development. All the efforts of the international community must contribute towards helping the Afghans take charge of their own destiny, particularly with regard to security. Q: What role do you envision for India in Afghanistan? HM: France considers the regional aspect to constitute an important factor for the settlement of the Afghan crisis. For historical, geographical and strategic reasons, India is a major player in the region. It therefore, unquestionably, has an important role to play. Its contribution to Afghanistan’s reconstruction has, moreover, been welcomed by the international community as it brings direct benefits to Afghanistan’s economic development, the well-being of the local people and the consolidation of the rule of law. Further, like all other countries participating in the ISAF, India constantly faces terrorist threats. For all these reasons, we attach especial importance to our dialogue with the Indian authorities on the situation in Afghanistan. Q: How do you envision the future of the French armed forces? HM: Over ten years ago, we undertook unprecedented military reforms through professionalism and ending drafting. These reforms were indispensable, given the change in the missions assigned to our armed forces, which are essentially engaged in foreign theatres and peacekeeping operations. Today, the threats still remain, as we see in Afghanistan, off the Coast of Somalia and the Sahel region. Hence, France continues to give priority to defence investments. But given budgetary constraints, France endeavours to optimise its defence resources. Thus, we are pursuing our modernisation policy with a view to better management and making our military mechanisms more appropriate for the ground realities of our foreign engagements, particularly through greater efforts with regard to equipment. As far as deterrence is concerned, we maintain a “strictly sufficient” arsenal, at the lowest level possible for preserving credibility, and which has been ensuring us peace since almost half a century. Is Wen 'putting on a show'?